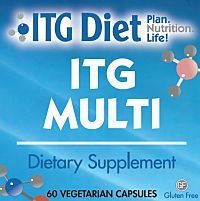 ITG Twice Daily multi vitamin was designed to provide nutrients that are difficult to obtain in the typical daily diet, especially when you are on the ITG 3 Step Weight Loss Plan and you are not eating all of the food groups. Especially nutrients such as 158 mg of Vitamin E, 200 mcg of selenium, 400 mcg of chromium, 500 mg Vitamin C and 400 mcg folates. Calcium and magnesium should be taken as a separate supplement.